In yesterday's post, I pondered how women react to our femulations. In general, spouses react negatively, while non-spouses react positively, but your mileage may vary. When my wife was pregnant, I worried about having a son. How would my son react to my crossdressing? Would it be better off if I hid my femulations from my son? Then again, I am not the most masculine guy. In fact, I am so feminine that throughout my life, I was considered gay. What effect would a feminine male role model have on my son? Thank, Goddess, we had a daughter. She turned out to be my greatest ally and once she even confided in me that if I decided to go all the way and have HRT and SRS, she would have my back. Over the years, I have found that the daughters usually support their transgender Dads. I do know from second hand experience that is not always the case, but in more cases than not, I have seen daughters lovingly help their fathers transition into the women they really are. What about kids who aren't your kids? Twenty-five years ago, kids who aren't your kids would consider us freaks. They might laugh and insult us in public. Today's kids are much more familiar with transgender folks. They see transgenders in the media every day and they may have friends or acquaintances who are questioning their gender, so being transgender is not a big deal. In the past, I had to be careful femulating when my daughter had friends visiting her. I either had to sneak around the house or worse, use the cheap motel option. But even that has changed. My daughter's last boyfriend saw me crossdressed a couple of times and did not give a damn. 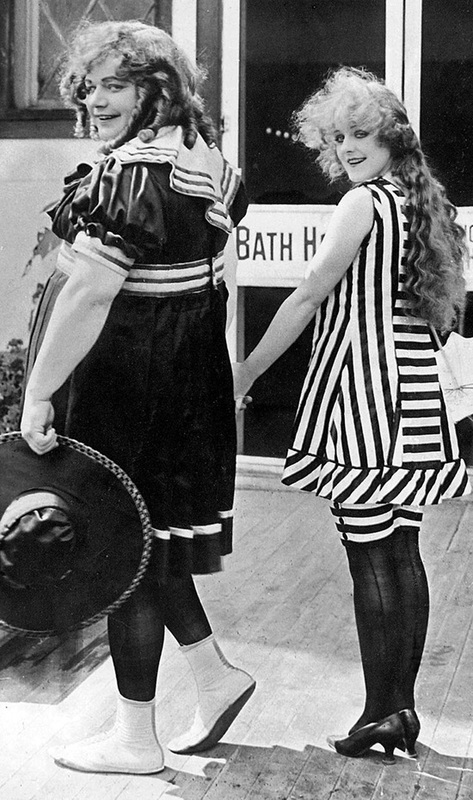 Roscoe "Fatty" Arbuckle femulating in the 1917 film Coney Island. One friend told the story many years ago about her six year old. She and her wife had explained to their daughter that sometimes, Daddy dressed like Mommy. So one day her daughter and some of her daughter's friends had gotten into the jewelry, makeup, etc. and came clomping through the room in her shoes. My friend asked her daughter, "Are you and your friends playing Mommy?" The daughter came back with, "No, we're playing crossdresser. It's a lot more fun." The commonalities between Stana and I never seem to stop. I could list them here however it would take too long. I also had the fear of having a son, and not being a good role model, I too have just one child a daughter. She doesn’t know about Paula, however I’m sure she wouldn’t be surprised. Transgender acceptance and reached a tipping point, and will continue to grow as this younger generation moves thru time. Colleges, high schools, and elementary schools all have transgender students these days. My daughters view is very accepting which mirrors others around her. Interesting aside she and other classmates are attending the wedding of lesbian friend in a few weeks. It’s no longer a controversial event, just another wedding. Even with the current political climate I have faith the we as a community will move forward. What we have been witness to is the slow but steady osmotic acceptance of all things trans. This comes about as more and more people in society start to realize that we are neither monsters or perverts but by and large just plain folk who sometimes present in a not so plain fashion. I always have viewed this as a Tortoise and Hare situation. People's perception will change over time but you simply cannot force the issue. I have two grown daughters and four grandchildren (2 boys/2 girls). One daughter is totally accepting; the other is coming around after much struggle. My oldest grandson (of the "struggling" daughter) learned of me when he was sixteen, and I wish I'd not waited so long for him to know me. Two years later, though, he now hugs me readily. There will be one big hug coming, by the way, as he soon will be leaving for Air Force basic training. I am looking forward to December, though. That's when my fifth grandchild, Sophia, will be born. It will be the first time that I will be known only as the woman ("Grams") that I am; the first family member that I will not have had to deceive or hide from. This is more than special to me! I have three boys. I am still coming to terms with a thing for shoes becoming a thing for dresses and make-up (although of course it has probably always been there deep down). I told my oldest (early 20s) just after I told my wife. She is struggling with the idea. He was just supportive and when a couple of days later he saw me for the first time in my only dress, he just hugged me. Not sure how he got to be so wise. Like you, my Daughter is my biggest supporter. I have found that since first coming out it has been the children who "get it" straight away and find it all no big deal. The adults may be a little different, but as a generalisation I do find women much more understanding. I have always suspected that for some men by rejecting our own masculinity they feel as though we are in some way undermining theirs. .....or, some men may feel ashamed of themselves for being attracted to a trans woman, even just a little bit.